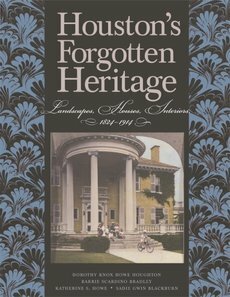 Houston’s Forgotten Heritage | The Junior League of Houston, Inc.
Texas A&M University press has re-issued the Junior League of Houston’s award-winning history book, Houston’s Forgotten Heritage: Landscape, Houses, Interiors, 1824 – 1914. The book, authored by Junior League members and first published in 1991, paints a broad picture of domestic life during the first 90 years of Harris County’s settlement. The League sponsored the development of Houston’s Forgotten Heritage through a project led by members Dorothy Knox Howe Houghton, Barrie Scardino Bradley, Sadie Gwin Blackburn and Katherine S. Howe. From 1983 – 1988, more than 50 Junior League volunteers collected, processed and cataloged thousands of private papers, library holdings and photographs to create the beautiful hardbound publication. Houston’s Forgotten Heritage traces the evolution of Harris County’s landscape, houses, interiors and domestic life from the early 1820s to 1914 when the opening of the Houston Ship Channel ushered in modern Houston. Richly illustrated with 275 photographs of houses and gardens which have long since disappeared, it depicts homes where the foundations were laid for much of the cultural life enjoyed in Houston today. Houston’s Forgotten Heritage received the Citation Award from the San Antonio Conservation Society in 1992. Dorothy Knox Howe Houghton, sustaining League member, is a direct descendant of Jane Birdsall and John Richardson Harris, for whom Harris County is named. She is a graduate of Bryn Mawr College and holds a Master’s degree from the University of Texas at Austin. Dorothy Knox is also the author of The Houston Club and Its City: One Hundred Years. Barrie Scardino Bradley, sustaining League member, has served as executive director of the Houston chapter of the American Institute of Architects, as editor of Cite: The Architecture and Design Review of Houston, and as architectural archivist of the Houston Metropolitan Research Center at the Houston Public Library. She is also the author of several publications including Houston’s Hermann Park: A Century of Community. Sadie Gwin Blackburn, sustaining League member, is a direct descendant of Harvey Allen, a brother of the founders of Houston. She is a graduate of Sweetbriar College and holds a degree from Rice University. She served as president of the Garden Club of America while writing a portion of Houston’s Forgotten Heritage. Katherine S. Howe, a sustaining League member, is a graduate of Connecticut College and the Cooperstown Program at SUNY, Oneonta. She is the former director of Rienzi, The Museum of Fine Arts, Houston collection of European decorative arts and of the Brown Foundation Fellows Program, a residency program at the Dora Maar House in Menerbes, France. A specialist in nineteenth-century American and 18th-century European decorative arts, she is best known as a co-author of Herter Brothers: Furniture and Interiors for a Gilded Age. For additional details, contact Publishing at 713.871.6608 or toll-free at 1.800.432.2665 or via email at publishing@jlh.org. All orders placed via the Junior League website will be shipped to the purchaser and will be subject to shipping fees. The Junior League offers ground shipping via USPS within the 48 contiguous states. To avoid incurring shipping fees, you may purchase your books in person from The Pantry at the League building, which is open Tuesday through Saturday between 10 a.m. and 3 p.m.